John Doucette Jr. will seek an early retirement in February. SKOWHEGAN — Skowhegan town manager John Doucette Jr. has announced he will retire early next year, months before the end of his contract. Selectmen approved Doucette’s resignation Thursday night. His contract is through next December, but he will leave on Feb. 28, said Betty Austin, chairwoman of the Board of Selectmen. “I’ve really appreciated the support of the Skowhegan people and it’s with a heavy heart that I do this, but I’m doing it for me,” said Doucette, 62. He would not elaborate on why he’s retiring early. “I don’t know what I’m going to do yet. I don’t have any real plans, just look around and maybe work part-time, do some things on my own or that I’ve wanted to do and relax,” said Doucette. Austin said Doucette’s resignation was unexpected. The search for a new town manager will begin in January, she said. “We were surprised. We haven’t started anything yet because we need to think about how we’ll handle it,” said Austin. She said she enjoyed working with Doucette and that in recent months he had given no indication that he might be thinking about retiring early. Doucette has been town manager since July 2008, taking over the position from Philip Tarr. During Doucette’s tenure he secured work done by the Army National Guard on several projects in town that otherwise would have had to be paid for by taxpayers. He instituted a code of ethics for appointed and elected officials that was adopted in May 2011, but later was suspended for one week without pay for violating the code. Selectmen said in November 2012 that they could not discuss the particulars of the violation, saying it was a personnel matter and that under Maine law they cannot reveal details of the violation. Doucette also wrote a road ordinance to establish firm guidelines for gravel and pavement requirements for road construction. He was actively involved in the rebirth of Main Street Skowhegan in 2010 and a member of the candidate interview committee for the nonprofit group’s new executive director, Dugan Murphy, who was selected in March. 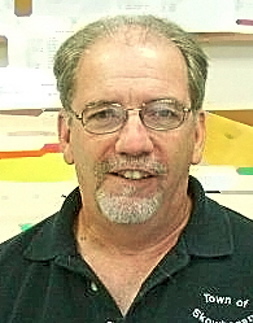 Doucette is also a former town manager in Norridgewock, a position from which he resigned in May 2008. He was a selectman in Norridgewock in the 1990s. Doucette served 21 years in the U.S. Air Force, including 14 years as a recruiter throughout New England, five-and-a-half of which were spent in Waterville. Before taking the job in Norridgewock, Doucette was manager of VIP Auto Center in Skowhegan. “I really enjoyed being a town manager in Skowhegan. I love the people and really think we’ve accomplished a lot over the five years I’ve been here,” he said.